Q: How do I embed a Research Guide into my D2L course? 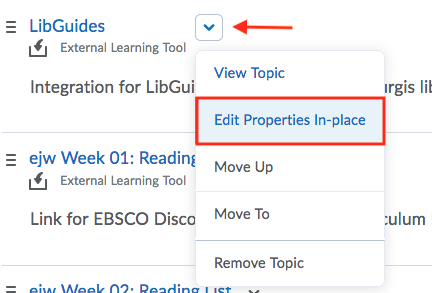 After the latest D2L update, faculty will now be able to directly embed library research guides into their D2L course. Faculty can browse the list of published research guides and embed an entire guide - or even just a single page or a single box - using their instructor interface. Log into D2L as an instructor. Open the "Content" tab. In the module in which you wish to add the research guide, open the "Existing Activities" menu (next to "Upload/Create"). Click on "External Learning Tools". Select "LibGuide" as the option. As with all External Resources, you will be able to change the title of this research guide to suit your needs. To edit the name, choose the menu option "Edit Properties In-place". Next, you'll need to choose which research guide to embed in your course. Click on "View Topic" to open the LibApps Library Content Selection box. The LibApps Library Content Selection box will appear. First, select the LibGuides site from the menu. Next, you'll be able to choose from several options. You can choose to embed an entire research guide, a single page from a research guide, or a single content box. Alternatively, you could embed a list of databases related to your subject. Work with your liaison librarian to determine what content is right for your course. Next, browse the list of guides or search for it by name. Every program of study at KSU has its own subject-specific research guide. In addition, you can request a course guide from your liaison librarian to match the specific needs of your course. Once you've selected a guide, you have the option of having the guide open automatically to a certain page of the guide. This step is optional. After completing the LibApps Library Content Selection, select "Embed Content". Refresh the page. 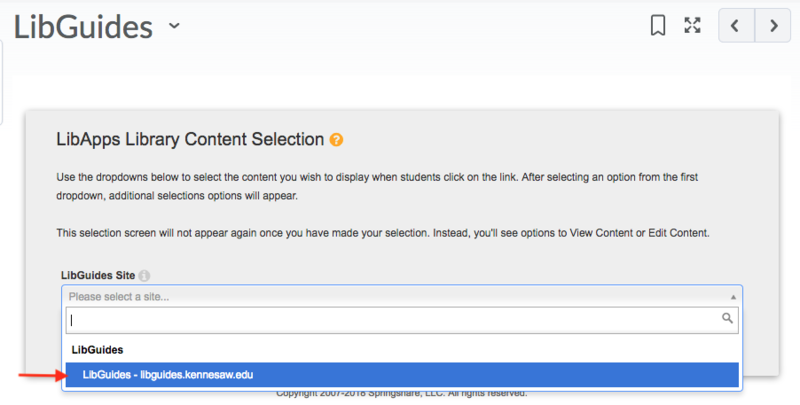 You can preview the content by switching to a student view in your D2L instructor interface, or you can use the LibApps Library Content Selection preview feature. To use this feature, refresh the page and select "View Content." Contact the KSU Library System with any questions at libraryreference@kennesaw.edu.